We spent 2 nights here in April. We were absolutely delighted with the beautiful accommodation. Every thing you needed was provided, down to robes and slippers. This property is every bit as beautiful as it is in the pictures. When you walk out of the bedroom's sliding doors onto the decking, it is just gorgeous. A hot tub with a view to take your breath away. We didn't want to leave and will definitely be back again. Loved our stay at the cow shed. Decor is so modern and clean. Everything felt like luxury! Loved the dressing gown and slippers. The welcome pack was very well put together and helpful. Lovely couple days away. Great location right next to the stream. Loved every minute of it. Thank you. We had a great two nights at the cow shed we can't wait to return as two nights wasn't long enough. The owners were so discrete we only bumped into them by chance. The perfect romantic escape. Photos don’t do justice to this beautiful cottage! It was even better than what we anticipated. If you’re wanting a proper break this is what you need. The cottage is located in a beautiful rural area so is extremely peaceful and relaxing with the added hot tub which looks out on to the Yorkshire dale hills to a beautiful little stream. In the bedroom there’s also a peep hole to look up at the sky whilst you’re in bed which was wonderful on clear night skies as you could see the stars as you fell asleep. The cottage is extremely clean from every aspect and was enjoyable to its full potential due to the kindness of Stephen and Julie supplying complimentary bath robes and slippers for the hot tub. Stephen and Julie are great hosts and welcome any queries you may have. Stephen even parked my car for me in the snow and icy weather conditions. They truly went above and beyond. Worth every penny, can’t wait to come back! We thoroughly enjoyed this stay in The Cow Shed and felt extremely special. Thank you Stephen and Julie! The Cow Shed is set in a beautiful picturesque location and it was made more amazing with the snow! We loved our stay at the Cow Shed. The location is beautiful, very peaceful and relaxing. The hot tub on the terrace has a lovely view of the beck, its lovely to sit and listen to the water. The cottage itself is very well done, very modern and comfortable, the underfloor heating keeps it really warm and cosy. Loved the big smart TV and good wifi which meant we could watch Netflix etc. The welcome pack was a lovely touch, as were the dressing gowns and slippers provided. Thank you for a lovely stay, we hope to be back! What a gorgeous setting... away from the mad bustle of normal life, in the middle of nowhere but an absolute haven. We would recommend daily walks to the local pubs but nights in enjoying the hot tub and home cooking. Kitchen facilities are limited but manageable if you do want to stay in. The location is so gorgeous though you just want to make the most of the hot tub and cosy environment of the Cow Shed, so toasty and comfy. We couldn’t fault it. Went for a weekend away with my partner. She said she wanted a hot tub so I found this little gem. When we arrived the cottage was warm and welcoming. There was a bottle of wine put out for our arrival which was excellent after a 5 hour drive. Could not recommend this place enough! Excellent location excellent views and all the facilities were fantastic! Really enjoyed our two days at The Cow Shed. If you’re looking for a beautiful and quiet location, it is perfect. The Cow Shed.... it certainly wasn't! What a hidden gem! The location made it that extra bit special, I cannot wait to return , autumnal colours around made it fabulous! A secluded peaceful location for a relaxing break. Definitely 5 star property, spotlessly clean and had everything we needed for a weekend away. The hot tub was amazing! And we will definitely be back. Julie and Stephen were available to respond to any queries and ensured we had everything we needed. Everything was as described on the website. What a place for the perfect escape. The location is fantastic, right next to a stream with you can view whilst sat relaxing in the hot tub and even wonder down to and view from the newly build small bridge. The facilities have everything that you need and the living area and kitchen is a good size and the tv huge. The dressing area between the living area and the bedroom is great and plenty of space for clothes etc. The bedroom is big with a very large bed and comfortable mattress and plenty of pillows and cushions. Bathroom facilities spot on and lovely hot water all the time. The heating was great and under floor heating great. Only a short drive to some nice local pubs and only 10 minutes to Kirby Lonsdale. We will definitely return. The pictures on the website do not do this place justice, it is so much bigger and nicer than they show. We were really impressed by the standards and the finishing touches like the dressing gowns and wine and biscuits. The hot tub was lovely with the view and sounds of the beck. The only downfall was we were told we could have stayed longer as no one was booked in after us, but we were already packed up and returning to our car, or we would have definitely stayed a couple of hours longer. Hope to come back in future! Thank you so much! Using text messages is not the best customer service. Location is not as private as it appears on web site. Lovely welcome of bread, butter. jam,milk tea coffee,& biscuits and wine . the patio door open the sound of the beck fantastic. .Hot Tub - 5 star. Hope everyone enjoys as much as we did. The Cow Shed is stunning in a very peaceful location. We stayed for two nights to celebrate our wedding anniversary and communication with Julie was brilliant. The welcome pack was a lovely touch as were the robes and slippers. This is a very well thought out accommodation with top end furniture and fixtures and to top it all a hot tub to sit in and relax admiring the views with a glass of fizz. I would not hesitate to recommend to anyone thinking of booking and hopefully we'll be back to celebrate our next anniversary. Thank you. Thank you for a wonderful relaxing stay. Just beautiful surroundings, location and accommodation. Definetly reccomend. A beautifully renovated tiny barn that is bijou and cosy, the Cow Shed is a perfect cottage for a couple to have a few days away in a remote romantic location. The property is a contemporary luxury space that was spotlessly clean and we were made to feel welcome when we met the owners, Julie & Stephen, who live very nearby. The cowshed is exactly as described and is in the most stunning location. The views are beautiful and we particularly enjoyed walking on the fell-side where we didn’t see anybody else and just chilling on the decking area or in the hot tub. It was so peaceful and relaxing. The cowshed itself is luxurious and beautifully presented. There are limited cooking facilities which is stated on the description but this was not at all an issue as there are lots of lovely eateries within a short drive. If I was being super critical, a larger kettle and a toaster would have been good, but that is a very minor point in what was a gorgeous property and we had a wonderful stay. We have used Mill House Cottages before staying at The Paddock and Settlebeck and the standard of these properties are exceptionally high , we would definately use them again and looking forward to trying out some of their other locations. We loved our stay at the cow shed. Our hosts were lovely and accommodating, the day before we arrived we contacted them to ask what rules and regulations were about bbqs, as the weekend was forecast good weather. They kindly arranged for a charcoal bbq to be at the cow shed for when we arrived. The location was perfect, very tranquil and picturesque. We were impressed with the quality of touches like the towels, pool towels and robes and the hot tub was amazing, making the stay extra special. 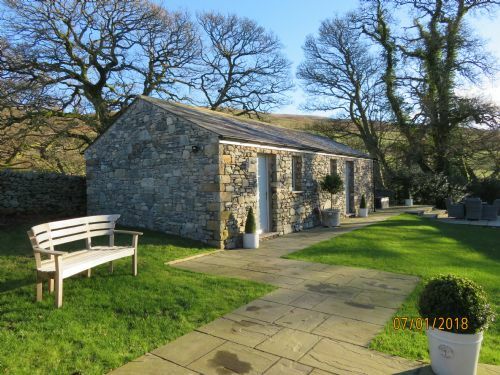 Myself and my husband booked the cowshed as a short break, just the 2 of us. It was truly outstanding. Everything from the location to the way the cowshed was decorated was more than we could have hoped for. The hot tub on the decking with the beautiful stream as our view. Just perfect. The owners were so friendly and helpful too. We would definitely book through mill house cottages againin the future. Jo & Lee. We stayed at the Cow Shed for a weekend in June. They have a number of properties - the Farmhouse itself lived in by the owners and further holiday cottages (Mill cottages). The Cow Shed essentially appears to sit in the back garden of the farmhouse and next to the holiday cottages. It is not in complete isolation but it did still feel quite private - particularly as we were told the owners were away, had they not been it may have felt a bit different. The Cow Shed itself has clearly been done to a high specification inside there is quite a fancy kitchenette in terms of the cupboards, 2 ovens and a dishwasher yet a mini hob and no microwave. Most people wouldn't want to be cooking but it seemed a bit of an odd combo but it doesn't matter. There's both a wine fridge and regular fridge and they left us a pint of milk, some muffins and a bottle of wine for arrival. The bed is very comfy, nice linens and the bathrobes are a nice touch, especially if you want to wander in and out and use the hot-tub. The hot tub is lovely, located by the stream, that did mean for us in June it was a horsefly/midge paradise, so somethign to be aware of - pack some citronella candles maybe! Location - I think it is described as a 30min walk to nearby village with pub, Barbon. If you jog maybe. We tracked it on our phone, it's 2.5miles to the pub (50minutes or so). Kirkby Lonsdale is about a 20minute drive away. In summary if you want to get away for a weekend with the other half and just chill out, it's a good spot! Wonderful accommodation 5stars. Very clean, well presented everything we required for our stay was there. The setting is fantastic, hot tub was great and we had the weather. It was just what we both needed. We had a lovely stay at The Cow Shed! It really is a little gem of a place in a stunning location. The interior is very tastefully designed and the complementary extras such as robes, slippers, wine and muffins were a great touch and made our short break that much more special. The hot tub by the river was truly relaxing and all facilities in the cottage itself were superb. Although the place itself is on the small side, the space is perfectly designed and indeed lived up to my 5* expectations. My only reservation was that there could have been a blind on the skylight in the bedroom, as we were woken up quite early by the bright morning light beaming down over the bed. Also perhaps there could be some kind of fence around the decking area behind the hot tub to ensure full privacy. But apart from that this place is the definition of luxury and I will definitely be recommending it to my friends and family. Thank you, we had a wonderful stay! We had a lovely stay in the super cosy cow shed. We had directions to get there which are needed as it is tucked away. The emphasis here is on privacy and you are left to settle in by yourself which is fine by us. Everything is laid out and we had some wine and cake waiting for us! We soon got settled in and unpacked in the lovely bedroom with a charming four post bed. We put the underfloor heating on straight away as it was a very cold day. It took a while to warm up but when it did it was very warm and cosy. The next day it snowed heavily so we decided prosecco and hot tub was the way to go. Perfect with the snow coming down and the river burbling away besides us. We then decided to walk to the barbon inn for lunch. What a lovely walk and great place. Such a warm welcome. Steve had phoned ahead and said we were on our way. We had steak sandwiches and beer by the fire. We chatted with everyone there before buying some local jam from a local resident and then some supplies from the shop and off we went back home to relax and watch Netflix on the huge TV. We had a superb stay. If you want quiet and relaxation in a cosy environment then this place is perfect. And looking up at the stars from the hot tub is a wonderful way to spend an evening. All round excellent. My only gripe was there was only one roll of toilet paper. Other than that it was perfect. A beautiful getaway with amazing views and fantastic hosts! The directions to the place were spot on (and indeed required) and it was apparent from the moment we got there that our hosts were both thoughtful and welcoming. The place was finished to a very high standard and the hot tub was a dream with the most stunning views of the hill-side. The bed was very comfy indeed and we both slept very well in the lovely warm surroundings despite the snowy conditions outside! The place is within a reasonably short distance of a fine dining restaurant which we went to on Saturday night (Hipping Hall) and there were also local recommendations left for us inside. Julie and Ste were great hosts and were always on hand if required. They also very generously let us check out late on our final day which meant we could make the most of the wonderful accommodation. I would have no hesitation in coming back again and hope to do so soon!